Track List:DISC ONE: JAAN PEHACHAAN HO.I SAW THE LIGHT.96 TEARS.LYSISTRATA.GET LUCKY. CLICHÉ.RUNNING BEAR .COMPASSION.TOO FAR GONE.BORN TO SYNTHESIZE*.DISC TWO:KINDHEARTED WOMAN BLUES*.FIRE (THE CRAZY WORLD OF ARTHUR BROWN)*.I DON’T WANT TO TIE YOU DOWN.BLOW ME.BLACK AND WHITE.PAST.ONE WORLD. Our first show from 2014. And WOW. This just in from our buddy Marc Linovitz. He mailed his audience recording on discs to me to share here. And what a pleasant surprise. This recording is prestene...very close to Soundboard quality. A delightful performace too.Thank you for your magic Marc! Maryland Super Fan Bill Hoyt had this to say, "One of the best things about this show was that Todd was enjoying himself. Great audience banter, and the miscues were all part of the fun. Not that miscues matter all that much, when Todd, Jesse, Kasim and Prairie are all pretty much joined at the hip having logged countless performance hours together. A highlight of the show came when John Ferenzik was invited onstage to back the band with some blues and some response playing to Todd's "scatting." It's always cool to see someone with an accomplished musical ear be able to replicate voiced notes, as John did for Todd on the piano. Very fun. I won't go into great lengths about the set list, in keeping with Todd's desire to keep things ‘unpredictable’, but he did sit at the piano for some songs, and that is always rewarding for me. I've always enjoyed it when Todd performs others' music, as he is always acknowledging his influences and interests, and it's clear that performing this way fulfills him also. So, at the end of the show when the gentleman at the table seated next to me said "He didn't play 'Hello It's Me'", I said, "Don't be surprised." Straying outside the known is always good for Todd and for his fans also. This was a great, fun show. Can we get an "Amen" for unpredictability?" Track List:DISC ONE:INTRO.FRIDAY.LOVE OF THE COMMON MAN.CLICHÉ.BANTER.RUNNING BEAR.I DON'T WANT TO TIE YOU DOWN.BANTER.BIG WEEKEND.BLACK & WHITE.ARE YOU HAVIN' ANY FUN.IT WOULDN'T HAVE MADE ANY DIFFERENCE.TOO FAR GONE.PAST.GET LUCKY.TODD'S DAFT PUNK STORY.BORN TO SYNTHESIZE.DISC TWO:96 TEARS.I SAW THE LIGHT.LYSISTRATA.IN THE YEAR 2525.HELLO IT'S ME.ONE WORLD. Note:The second show that we have from 2014. Probably my favorite 'Unpredictable' 2014 set list, for you can really tell Todd is very relaxed and enjoying this Niagara Falls Show. And it’s a ‘Friday’! A decent audience recording by 'Richard Binko'. But the levels are all over the place and take much EQing to get distortion out. Apparently ‘Binko’ records a gazillion artists shows for torrent sharing on Traders Den. The only problem being with that is, he may not be a huge Todd fanatic like you and I. And the people apparently with him as well. Of all songs for the people sitting next to him to yap through is ‘Cliché’. Some girl talks through the whole tune. But Todd has fun with the ‘Native American’ locals. And teases them with ‘Running Bear’. The what I call ‘cheesy’ tunes are turned into wonderful pieces! Having said all that, this is an incredibly awesome performance. Local Todd Fan Kevin Scull had this to say, "A full house of about 500 packed the Bear's Den at the Seneca Casino in Niagara Falls. Todd and his usual band mates were in fine form. The band was relaxed and Todd played a seated set on bar stool and piano bench. It is always a pleasure to see such a professional performer who makes you so glad you went and supported his effort. He also shared an interesting story about attending an after the Grammy Awards party, courtesy of Daft Punk, with Michelle and Rebop. The fantastic One World finale had everyone wanting one more song. That's what makes me look forward to yet one more show." Track List:JAAN PAHECHAN HO.LYSISTRATA. RUNNING BEAR. I DON'T WANT TO TIE YOU DOWN. BLACK AND WHITE.SQUIDBILLIES SONG.BORN TO SYNTHESIZE.IN THE YEAR 2525.SONG OF THE VIKING.PAST. TOO FAR GONE.LOVE OF THE COMMON MAN.GET LUCKY.I SAW THE LIGHT.PISSIN.PATCHES.ONE WORLD. IT WOULDN'T HAVE MADE ANY DIFFERENCE.FIRE.HELLO IT'S ME. Track List:JAAN PAHECHAN HO.I DON’T WANT TO TIE YOU DOWN.LOVE OF THE COMMON MAN.RUNNING BEAR.CLICHÉ.PATCHES.BORN TO SYNTHESIZE.BLACK & WHITE.GET LUCKY. IT WOULDN’T HAVE MADE ANY DIFFERENCE.TOO FAR GONE.COMPASSION.96 TEARS.I SAW THE LIGHT.ENDLESS PRAIRIE.PISSIN’. IN THE YEAR 2525.LYSISTRATA.PAST.HAVIN’ FUN.HELLO IT’S ME.ONE WORLD. Note:Here's another Southeastern US 'An Unpredictable Evening' audience recording from our ever faithful 'Moz'. This one sounds like he may have been a little more further from the main stage. But still a stellar grab! Thank you Mike! Track List:JAAN PAHECHAN HO.LYSISTRATA.CLICHÉ.96 TEARS.PISSIN.ARE YOU HAVING ANY FUN.BLACK & WHITE.RUNNING BEAR.I DON'T WANT TO TIE YOU DOWN. SONG OF THE VIKING.COMPASSION.TOO FAR GONE.ENDLESS PRAIRIE.I'M A GUN (MOSTLY THE'PLAYBACK' OF THE LORNE GREENE 'SINGLE').BORN TO SYNTHESIZE.GET LUCKY. I SAW THE LIGHT. IN THE YEAR 2525.ONE WORLD.PAST.FIRE.HELLO IT'S ME. Note:Another fantastic recording from our ever faithful Mike Mosner ('Moz') as he ventures around the Southeastern US. We have to appreciate him so much. Thank you Mike! All his stuff is always very good and ESSENTIAL.Very much worth the download and very much worthy of the CD 'burneth'! Local Super Fan John Branning (John attended the Greenville Show too) had this review of the show: "Todd's voice was in excellent shape, with high and clear falsettos’ evident right from the start. Kasim smiled more, and bantered with Todd. Jesse and Prairie were there usual impeccable selves. Even the non-super fan that attended will have left knowing that these are the epitome of professional musicians. Talent spills from every pore. Such an ‘unplugged’ look with the stools of course. But Jesse doesn’t stay seated long. And Prairie is standing with full set in front of him (including bongos). But much of the tunes are very much ‘plugged in'. Todd rocks when he wants too. Track List:JAAN PAHECHAN HO.LYSISTRATA.I DON'T WANT TO TIE YOU DOWN.RUNNING BEAR.BLACK & WHITE.CLICHÉ.96 TEARS.ARE YOU HAVING ANY FUN.SOUL BROTHER.PISSIN.GET LUCKY.SONG OF THE VIKING.IT WOULDN'T HAVE MADE ANY DIFFERENCE.TOO FAR GONE.PATCHES.I SAW THE LIGHT. FIRE. LOVE OF THE COMMON MAN.HELLO IT'S ME.PAST.IN THE YEAR 2525.ONE WORLD. Track List:MATCHBOX.IT DON'T COME EASY.TALKING.WINGS.TALKING. I SAW THE LIGHT.TALKING.EVIL WAYS.TALKING.ROSANNA.TALKING.KYRIE.TALKING. BANG THE DRUM ALL DAY.TALKING.BOYS. DON'T PASS ME BY.TALKING.YELLOW SUBMARINE.BLACK MAGIC WOMAN/GYPSY QUEEN.BAND INTRODUCTIONS.HONEY DON'T.TALKING.ANTHEM.TALKING.YOU ARE MINE.AFRICA.MARK RIVERA INTRO.OYE COMO VA. LOVE IS THE ANSWER.I WANNA BE YOUR MAN.BROKEN WINGS.HOLD THE LINE.TALKING.PHOTOGRAPH.ACT NATURALLY.WITH A LITTLE HELP FROM MY FRIENDS.GIVE PEACE A CHANCE. Note:Another good audience summer 2014 recording from New York with minimal yap. Another one seemingly recorded from a good distance from the stage though (‘mics split 2 feet on loge ledge lip aimed at right stack’?). Mr. Railing went to great lengths to split the ‘chatter’ as separate tracks. As always with Ringo’s All Starrs, year after year, tour after tour and night after night the Artists’ performances are all very tight and professional. Has anybody ever given a bad review? Of course all of us here are all about our man Todd and his music. And he can do no wrong. But he really accents each and every tune with his musicianship and vocals. Todd sounds very upbeat and happy here. All these guys could’ve gotten by merely by playing the nostalgia card. Instead, this smoking band assembled to give us so much more. Same line - up: Ringo, Todd, Gregg Rolie, Gregg Bissonette, Steve Lukather, Richard Page, Warren Ham and Mark Riviera. However, Little Steven and Billy Squire 'guest' on last two tunes. Track List:INTRO.MATCHBOX.IT DON'T COME EASY.WINGS.I SAW THE LIGHT.EVIL WAYS.ROSANNA.KYRIE.BANG THE DRUM ALL DAY.BOYS.DON'T PASS ME BY.YELLOW SUBMARINE.BLACK MAGIC WOMAN.HONEY DON'T.ANTHEM.YOU'RE MINE.AFRICA.OYE COMO VA.LOVE IS THE ANSWER.I WANNA BE YOUR MAN.BROKEN WINGS.HOLD THE LINE.PHOTOGRAPH.ACT NATURALLY.WITH A LITTLE HELP FROM MY FRIENDS.GIVE PEACE A CHANCE. Track List:MATCHBOX.IT DON'T COME EASY.WINGS.I SAW THE LIGHT. EVIL WAYS. ROSANNA. KYRIE. BANG THE DRUM ALL DAY. BOYS.DON'T PASS ME BY.YELLOW SUBMARINE.BLACK MAGIC WOMAN. HONEY DON'T.ANTHEM.YOU ARE MINE.AFRICA.OYE COMO VA. LOVE IS THE ANSWER. I WANNA BE YOUR MAN.BROKEN WINGS. HOLD THE LINE. PHOTOGRAPH.ACT NATURALLY.WITH A LITTLE HELP FROM MY FRIENDS.GIVE PEACE A CHANCE. Note:Another audience recording from what sounds like a great distance from the stage. This one a little more so than these other recent audience Ringo recordings. Very disappointing too, because the poster listed an entire paragraph on recording equipment and technique!? The finished product, to my ears, sounds boxy/bassy and ‘monoish’. We’re so very grateful to these fans for capturing ‘historic record’. But this one is just not good. The performances are great and the Chicago crowd is very much into it. I still contend that 6/24/14 Artspark is probably the better audience recording out of these summer Ringo shows. Track List:MATCHBOX.IT DON'T COME EASY.WINGS.I SAW THE LIGHT.EVIL WAYS.ROSANNA.KYRIE. BANG THE DRUM ALL DAY.BOYS.DON'T PASS ME BY.YELLOW SUBMARINE.BLACK MAGIC WOMAN.HONEY DON'T.ANTHEM.YOU'RE MINE.AFRICA.OYE COMO VA. LOVE IS THE ANSWER.I WANNA BE YOUR MAN. BROKEN WINGS.HOLD THE LINE.PHOTOGRAPH.ACT NATURALLY.WITH A LITTLE HELP FROM MY FRIENDS. GIVE PEACE A CHANCE. Note:Actually, I thought this one would sound better than the above 6/24/2014 outdoor recording (not),for this is a Casino venue. It sounds like the taper was a good distance from the stage. But in his (‘Whotapes’) notes he says ‘Section A Row 10’? Still thankful for the recorder to share this, and the performances by all musicians are stellar. Note:Another one from Virginia Superfan Marc. It's marvelous. Marc says, 'Recorded from the center, at my favorite area of club'. Here's a neat review by 'TRRenaissance': “Todd did Black and White (my big wish for the night so I could have gone home happy after the third song), Cliché, a jazzy version of Born to Synthesize, and a stunning encore that included Too Far Gone, another Greatest Hit that I can't remember, and ended with a mega-anthemic One World. I also appreciated hearing It Wouldn't Have Made Any Difference; the last two years he did it Twist style but this time it was right off of S/A. The thing that made this concert so enjoyable was that TR was relaxed and in good spirits, engaging with the audience the whole night. He spent the entire night sitting down, either on a stool with his guitar or at the piano. 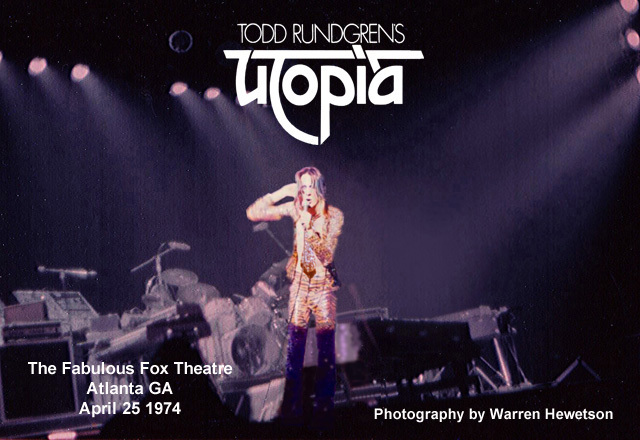 In fact, this concert could well have been called An Evening With Todd Rundgren, because it felt like a low-key party at a guy's house rather than A Concert. He consulted the set list after almost every song and seemed to be taking the concert in different directions on the fly. You want Unpredictable? How about Muskrat Love, by the Captain and the Toenail (in TR's words). It worked, dang it. Now that's Unpredictable. Track List:HELLO THERE.I DONT WANT TO TIE YOU DOWN.RUNNING BEAR.LOVE OF THE COMMON MAN.FRIDAY. ARE YOU HAVING ANY FUN.BLACK AHD WHITE.FIRE.CLICHÉ.BIG WEEKEND.SONG OF THE VIKING. IT WOULDNT HAVE MADE ANY DIFFERENCE.TOO FAR GONE.COMPASSION.ENDLESS PRAIRE.I SAW THE LIGHT.HELLO IT’S ME.LYSISTRATA.MUSKRAT LOVE.THE WHEEL.PAST.LOVE IN ACTION.ONE WORLD. Track List:HELLO THERE. THERE GOES MY INSPIRATION. I DON'T WANT TO TIE YOU DOWN. BLACK & WHITE. IT WOULDN'T HAVE MADE ANY DIFFERENCE. BLOW ME (WITH RED PETERS).FIRE. 96 TEARS (WITH GREG HAWKES).MUSKRAT LOVE (WITH GREG HAWKES).I SAW THE LIGHT. TROLOLO. LOVE OF THE COMMON MAN. PAST. LOVE IN ACTION. Note:This is only entered here for collection listing purposes really. It's parts and pieces (but most of) the show given to me that were recorded via video by a fan that would like to be identified only as 'walkerbrothersmusic' (the soundtrack from the video). Strangely enough, the audio comes out pretty good (even with stereo seperation). In fact, a few of the tracks came out particularly well...And due to the fact Greg Hawkes and Red Peters'guested' at this show, I think it's special and a real 'keeper'. Track List:JAAN PAHECHAN HO.LYSISTRATA.EBOLA BANTER. I DON'T WANT TO TIE YOU DOWN.BANTER.96 TEARS.BLACK & WHITE.BANTER.MUSKRAT LOVE. BANTER.ARE YOU HAVIN' ANY FUN. I SAW THE LIGHT.FIRE. IT WOULDN'T HAVE MADE ANY DIFFERENCE.SONG OF THE VIKING.COMPASSION.BANTER.RUNNING BEAR .BANTER "CHANTILLY LACE".BLOW ME. CLICHÉ.TROLOLO. HELLO, IT'S ME.LOVE IN ACTION.PAST.THERE GOES MY INSPIRATION.ONE WORLD. Track List:DISC ONE:CROWD. JAAN PAHECHAN HO. INTRODUCTION.LYSISTRATA. I DON'T WANT TO TIE YOU DOWN.BLACK AND WHITE. GROUND RULES. LOVE OF THE COMMON MAN. TROLOLO. RUNNING BEAR. CHANTILLY LACE (TEASE).COMPASSION. SONG OF THE VIKING.CROWD (INTERMISSION).DISC TWO:CROWD.BAND BACK FOR SET 2.MUSKRAT LOVE. I SAW THE LIGHT. BORN TO SYNTHESIZE. KIND HEARTED WOMAN. ARE YOU HAVING ANY FUN. BLOW ME. FIRE. HELLO IT’S ME. ENDLESS PRAIRIE. LOVE IN ACTION. ENCORE APPLAUSE. IT WOULDN'T HAVE MADE ANY DIFFERENCE. ONE WORLD. CROWD.